Hurricane Patricia has developed in the eastern Pacific and after a period of rapid intensification has become the most intense hurricane in the eastern Pacific in recorded history. US Air Force aircraft have been flying reconnaissance missions in and around the hurricane and their latest data suggest 1-minute average winds are near 200 mph and the central pressure is 880 mb. This beats previous records in the east Pacific set by Hurricane Linda in 1997 and also beats the Atlantic record set by Hurricane Wilma in 2005. Only in the western Pacific have there been a handful of tropical cyclones with a lower central pressure, and Patricia is even more intense than notorious tropical cyclones such as Typhoon Haiyan which struck the Philippines in 2013. The lowest pressure for a tropical cyclone globally was 870 mb set by Typhoon Tip in 1979. Many intense tropical cyclones peak in intensity over oceans and either dissipate without making landfall or strike land at a much lower intensity. 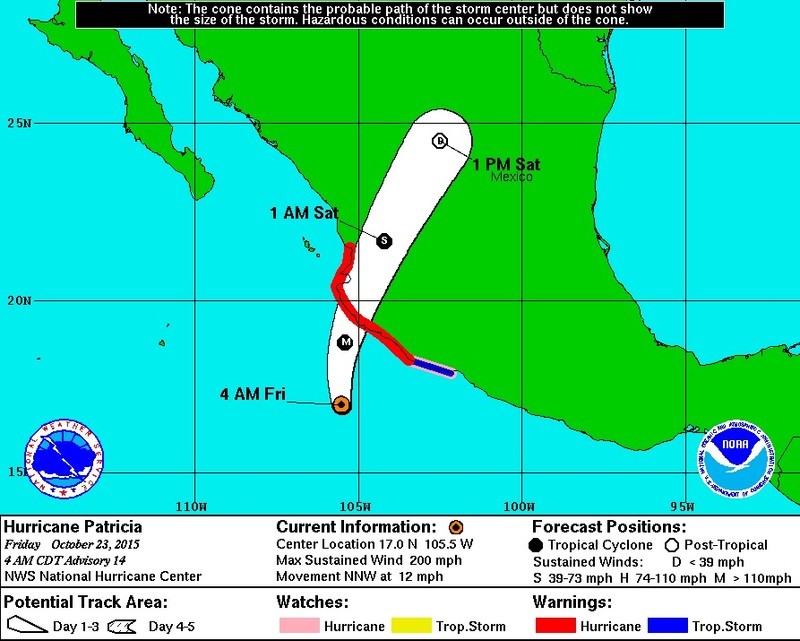 However, Hurricane Patricia is expected to make landfall over the Pacific coast of Mexico within little more than 12 hours. Thus, if any weakening occurs before landfall it will be fairly minimal. Records dating back to 1949 indicate that no category 5 hurricane has ever struck the Pacific coast of Mexico, so potentially another record could soon be set. Based on latest National Hurricane Center forecasts landfall is likely just to the west of Manzanillo this evening local time (early hours of Saturday UK time). Whilst the strongest winds are likely to be experienced close to the coast, Patricia is expected to bring heavy rain well inland over the next day or two with several hundred millimetres possible. The exceptionally active tropical cyclone season seen across the North Pacific Ocean is primarily as a result of the strong El Niño which has existed for the last few months. This has raised sea surface temperatures well above normal in this region and also made atmospheric conditions conducive to development of frequent and strong tropical cyclones. Here are some of the recent statistics on tropical cyclone activity in 2015, bearing in mind that any records relate to the era of reliable satellite data coverage from the 1960s and 1970s onwards. Three major (category 3 or above) tropical cyclones have been active simultaneously in the North Pacific four times on record – two of those occasions have been in 2015. Tropical cyclone activity in the central Pacific region (140-180°W longitude) has been about six times its normal level. Statistics on recent northern hemisphere tropical cyclone activity are courtesy of Dr. Phil Klotzbach of Colorado State University (@philklotzbach). This entry was posted in Met Office News and tagged eastern pacific, El Nino, heavy rain, hurricane, National Hurricane Center, pacific, rainfall, record, wind. Bookmark the permalink.